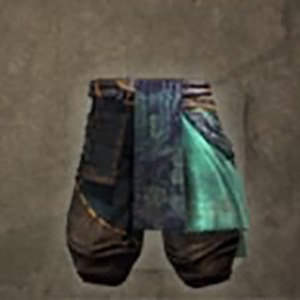 Kojuro's Armour: Hizayoroi is a Leg Guards in Nioh. "Light yet durable waist and thigh protection made in a style reffered to as "kanemaze" for the way it mixes iron plates with leather. Part of a traditional armour set known as Tosei-gusoku in Japanese, the hot-blooded Shigenaga inherited the Yukinoshita black-lacquered armour from his father, Katakura Kojuro, who was a loyal servant of Date Masamune. Shortly after Shigenaga's coming-of-age ceremony, the Battle of Sekigahara broke out, and while Uesugi Kagekatsu was taking up arms in Aizu (present day western Fukushima prefecture), Shigenaga found himself joining his first campaign as part of the efforts to capture the Uesugi's Shiroishi Castle (souther Miyagi prefecture)."